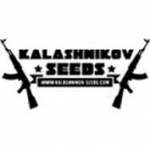 Kalashnikov Seeds - Purple Russian Express. Free US delivery. Purple Russian Express is 80% indica and the offspring of extremely elite parents. The result of crossing Big Daddy Purple with both White Russian and a secret hybrid breeding strain it becomes, at maturity, a colourful combination of purple-hued flowers and snow-white, resinous trichomes. Truly a visual delight it is not only this strain's appearance that will impress growers. Yield, taste and effect are also top-notch. Growing to a medium height of between 90 - 130 cm. tall in just 60 - 65 days of indoor flowering growers can harvest 500 - 600 gr/m2 of purple-coloured buds whose colour will be intensified by night-time temperatures which are considerably lower than those during the day. Outdoors between 800 - 1200 gr/plant can be produced and in this environment the colours are likely to really be seen at their best. THC production is very good at 21% and the effect of this marijuana strain is powerful for both the mind as well as the body. It is very useful to relieve stress and pain and can also help those suffering the debilitating effects of insomnia as well as countering the loss of appetite and issues with muscle spasms.